SmithGroupJJR hosted a packed audience for the Chicago Workplace Evolutionaries (WE) Hub on January 31. Moderated by Kate North, managing director of workplace innovation at Colliers, the panel included Gaylene Domer, vice president of facilities management; Alex Denja, chief operating officer of the National Equity Fund (NEF); and a special bonus video from NEF’s visionary CEO, Joe Hagen who could not attend in person. The panel produced ample food for thought and created a robust discussion filled with new insights. Benjamin Cordani, director of human resources at Caterpillar Global Mining and Arnold Levin, principal workplace strategies at SmithGroupJJR offered insights from their work in the planning and design of a new facility that will bring together three business units in Tuscon, Arizona. Shona O’Dea, building performance analyst at DLR Group provided an overview of how sustainability programs that improve the workplace can drive higher performing spaces and the metrics they use to ensure compliance goals are met. Kay Wulf, principal and workplace studio leader from SmithGroupJJR rounded out the discussion with details of SmithGroupJJR’s Chicago office post-occupancy indoor positioning study. They are using their workspace as a learning lab to collect and analyze how the space is performing and supporting their business. The Chicago WE Hub event drew a capacity crowd – Photo courtesy of SmithGroupJJR. The focus of this WE Hub event was “Measuring What Matters.” Identifying the metrics most important to the organization is not only a critical foundation when developing a robust workplace strategy, it also provides the evidence needed to assess and evolve the workplace performance. Kate North continued to share how WE has taken a leadership position in helping members understand how they can measure all aspects of a workplace strategy. While real estate costs consume a significant percentage of corporate budgets, it is still “all about the people” and as such, our goal should be to positively impact human performance. According to Kate Lister, from Global Workplace Analytics, a 10 minute increase in daily productivity could entirely offset a person’s workplace costs! Lister has hosted numerous WE sessions to address the ROI of workplace. She continues to help organizations build their business case, establish goals, and measure results. A lack of post-evaluation expertise. “In the era of data analytics, there is no excuse for organization not to assess the importance of measuring what matters and capturing a integrated set of data points that help determine how the workplace impacts human performance,” says North. The National Equity Fund team led the discussion by sharing a video interview with CEO, Joe Hagen, who clearly articulated the strategic value their workplace strategy had on their organization. He also noted the important role that Gaylene Domer, vice president of facilities, played in developing a compelling vision and how she built her business case that convinced him to embark upon their workplace transformation. Their strategy not only included a workplace relocation, but also the initiation of a work from home program that was inspired by data collected from interviews, focus groups, surveys, commute scans, and observations. This data not only informed the design of their new facility but it also provided important insight as to the readiness of managers and employees in adopting a work from home program. Preparing employees for working in a new environment and remotely was a big part of their change management strategy. NEF was able to track financial benefits of workplace changes by analyzing fundamental data points. Image courtesy of NEF. SmithGroupJJR is working with Caterpillar to develop the new headquarters for their Surface Mining & Technology. Determining overall goals, how to meet them, and how results would be measured was a team effort led by HR. Caterpillar’s new facility in Tucson was designed with a clear strategy for meeting goals and ensuring measurable outcomes. Image courtesy of SmithGroupJJR. Introducing how the project was organized and is being carried out, Levin outlined some of the leading ingredients that are contributing to the success of the project. First, the team confirmed that space is not the total enabler of productivity. That in mind, they ensured that HR was an integral part of the project team, as facility managers and CRE have an alternate perspective on how the project should be set up and delivered. Due to the complexity of merging three locations into an entirely new facility demanded a broader viewpoint in establishing project parameters, and indeed HR input for strategy development and transformation programs is a critical element for organizing the work. Large initiatives like this are often relegated to just examining square footage and space efficiency, and organizational performance is often overlooked by the design profession. The Caterpillar project is succeeding because the team is working with the premise that space is a tool to deliver the business. HR and the CFO are on board and understand that the new facility will be a space that helps the company and people succeed. Aligning strategy, goals and determining essential outcomes help the project team define a work plan to keep the project on target – Image courtesy of SmithGroupJJR. Surveying employees – Using pre and post-occupancy surveys of employees to measure success. Collaboration – Enabling and facilitating a culture of greater collaboration both within groups and among business units: breaking down siloes. Talent – Being able to attract the expertise required to move SM&T to continue to be a leader and to innovate. Diversity – Being able to attract diverse gender, demographic and racial talent to SM&T. Best practices – Exploring and identifying best practices within the various business units and creating metrics to test successful workplace design strategies. Future proofing – The design strategy for the building will enable cost-effective future expansions that can be measured by minimizing cost expenditures, time, and disruption. This summary is just a small part of the overview presented but illustrates how companies can derive greater value in delivering new space by partnering among all stakeholders and being more inclusive of who “sits at the table” from day one. In the case of the Caterpillar project, both Arnold and Benjamin emphasized how working together to determine how the new facility would help change the culture to be more solutions and customer focused and re-brand the division in their new facility. Creating space to support success – by breaking down silos (physically) and providing more opportunities for interaction through collision to solve problems. By studying the structure of the business in advance, the team was better able to provide architectural design solutions to encourage those interactions to happen. They also were thinking in advance of how they could measure the success of the space once it was completed and how to measure the performance of the space against the goals established for the business. The new Caterpillar facility was purposefully designed to promote productive interaction among formerly siloed employees – Image courtesy of SmithGroupJJR. Having a well thought out plan, developed by a team representing multiple facets of the organization will facilitate determining what to metrics can be established to evaluate success on a continuing basis. Making sure messaging along the project timeline is clear and engaging can adequately prepare for a large-scale workplace transformation. Preliminary employee surveys can help gauge the temperature of staff sentiment and thoughts about workplace issues and identify areas that may need significant attention during the design phase and inform what kind of educational/training measures may be required to ensure the people can fully use the space once they move into it. These endeavors can also serve to establish what benchmarks should be established to properly evaluate and measure the actual success of the workplace transformation once it goes live. Developing a methodology, preparing for change, and planning for how to measure effectiveness of change are all critical elements of being ready and able to measure project success – Image courtesy of SmithGroupJJR. 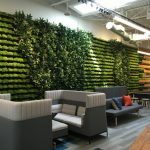 DLR’s Shona O’Dea has made a career out of her curiosity on how environmental factors, (light, view, daylight, physical comfort, acoustics, natural elements, biophilic design elements, and air quality) affect workplace performance. She emphasized the importance of setting measurable goals to determine the efficacy of these critical qualities to set performance objectives. For example, noting that the brain goes into sleep mode without fresh air, recognizing the importance of environmental issues does play a part in determining what factors play into successful workplace design. So, why wouldn’t companies consider these items when planning new spaces? Current research shows that access to light and views increases focus work. Shona’s research investigated testing results across DLR’s offices to assess where changes needed to be made to improve the physical environment. This provided an example of what can be tested and measured, shows the most significant areas where improvement can be achieved. Making spaces comfortable (temperature) in the DLR study showed that improving air quality yielded a 12 percent improvement in employee productivity, increased acoustical control improved performance by 68 percent, providing natural (biophilic) design elements netted a 15 percent improvement in promoting high cognitive function and better air quality and proper ventilation created as much as a 300 percent gain in productivity. Increased understanding of all the elements that contribute to healthy workplaces and environmental factors and being able to track and measure results can contribute to an overall improvement in all aspects of workplace design. Research across DLR’s offices yielded information that enabled areas needing improvement could be identified – Image courtesy of DLR. Kay Wulf rounded out the discussion by presenting how SmithGroupJJR, is using their own experience in the planning and design of their new Chicago office as a learning lab to not only improve their employee’s workplace experience but to help them provide better outcomes for their clients. Before relocating to new space, the design team worked to figure out what problems needed to be solved by providing a new work environment for their employees. Defining the culture in place and determining how to match the new space to support the underlying culture was one area of investigation. It was decided that providing an agile office environment to help project teams was the right solution. The activity-based space is an open studio supported by alternative spaces for collaborative or quiet work. The event included tours of SmithGroupJJR’s new workplace – Image courtesy of SmithGroupJJR. Preliminary to the design surveys were conducted to evaluate what people wanted, and since occupying the space, multiple tools are used to track data and measure results and to see what is working well, and what design elements may need to be tweaked a bit to get optimum usage. The discussions centered around real estate expense vs. human investment. SmithGroupJJR’s investigative process yielded a workplace design that was responsive to employee needs and perceptions of how they thought they could do their best work – Image courtesy ofSmithGroupJJR. The continuing effort to track data on utilization and occupancy has offered the opportunity to re-evaluate what spaces are most popular, and a room scheduling product (that is used across all SmithGroupJJR offices) gives additional data on space usage. Of course, “old school” methods of physical observation and post it note surveys have been used! Using multiple tools to assess how space is working has enabled the team to have accurate information showing how their space is used. Developing the methodologies to analyze their space does carry over into their project work for clients. Looking at the data through different lenses offers opportunities to get a clear picture of how a design element is working and see where improvement is needed or where a design feature is working very well. What is most interesting is how the data can be transferred to a graphic image to tell the story in an accessible format. A few examples follow. Other data maps included path of travel analysis, generational similarities (how and where space was being used), standing height desk use, user group analysis, occupancy vs. utilization study, and conference room utilization. 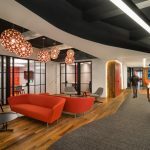 Configurability / adaptability of space: does an agile office environment contribute to more reconfiguration and how often? Further, examine the project assignment and studio of employees to analyze if that impacts agility. Examine if a classification system of personas/location patterns could be defined to determine the type of spaces needed and work habits. Consider Topological Data Analysis the compare differences and quantify changes across time for a given combination of space and employee attributes. Analyze spaces for employee preference – the first to be occupied and last to be vacated during the day. Want to accelerate your Workplace IQ? Come join us at Facility Fusion! I am going to visit this city, so the information above is very good for me. I will read all the details and use them in my trip. I regret not going there… Hope I’ll have a chance some day.